Although humans, livestock, feral pigs, cats, and mongooses have all done their best to destroy their habitats and kill them outright, birds are about the most numerous and visible non-marine vertebrates of any size in Hawaii. 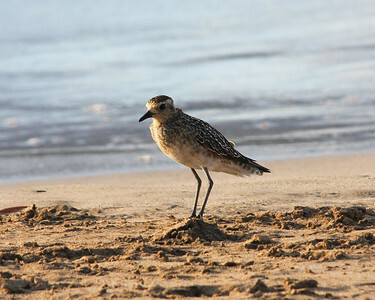 However, they are very shy and wary of humans, and so birdwatching requires more patience than on the mainland. 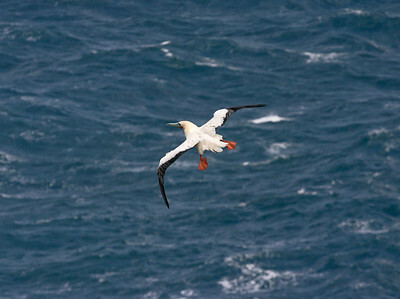 A Red-Footed Booby (Sula sula rubripes) glides on the updrafts created by the steep basalt cliffs of the cove adjacent to Kilauea Point, north Kaua'i. 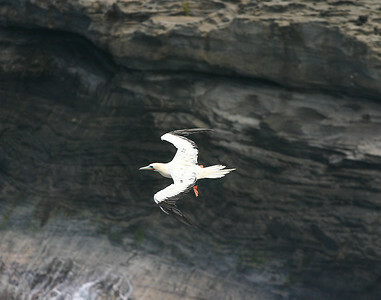 The boobies at Kīlauea Point are a white color morph. 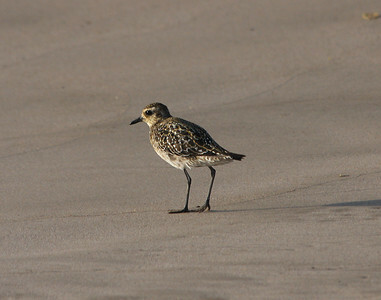 Adult birds have a white body and tail plumage. 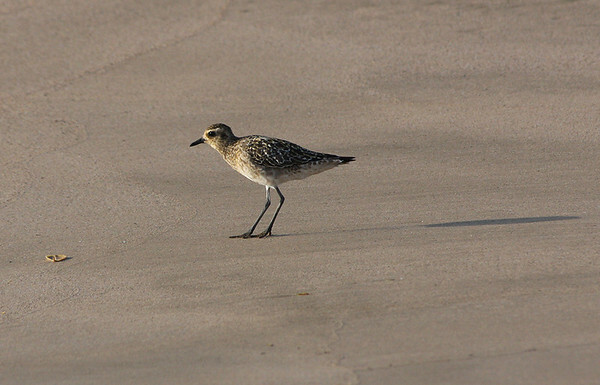 Upper wings have black primary and greater secondary coverts. 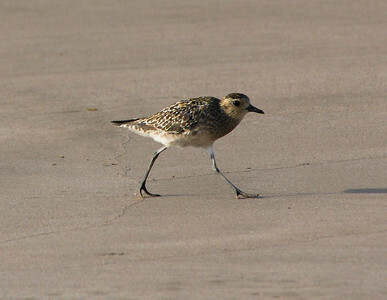 This species is seen year-round at Kilauea Point. Approximately 1,400 to 2,500 pairs nest at the refuge annually. Feeds by diving vertically into the water (rarely within the sight of land). 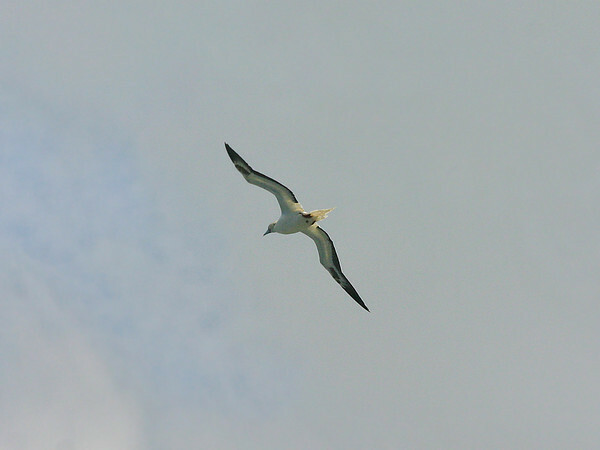 May dive up to 10 meters to pursue prey, which is primarily flying fish and squid. 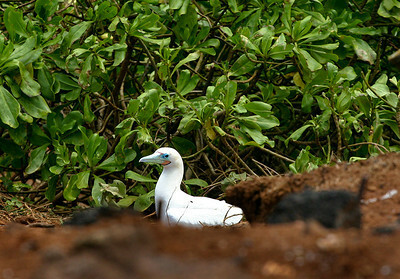 A Red-Footed Booby (Sula sula rubripes) comes to rest in a clearing at Kilauea Point National Wildlife Refuge, north Kaua'i. 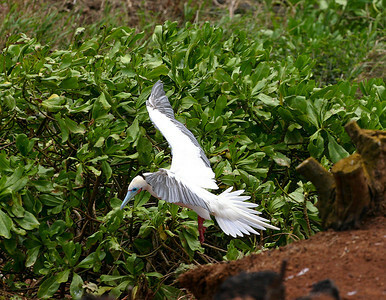 A Red-Footed Booby (Sula sula rubripes) roosting in a clearing at Kilauea Point National Wildlife Refuge, north Kaua'i. 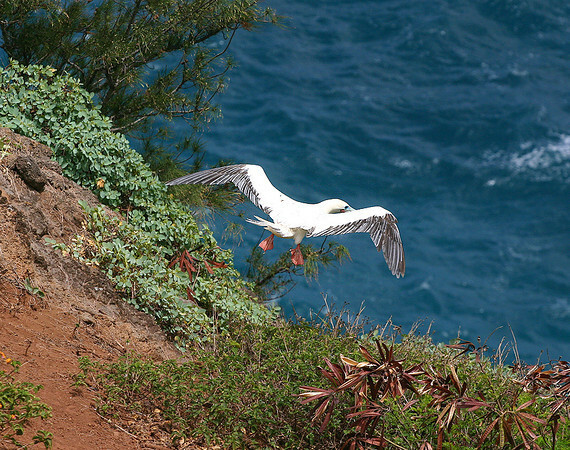 A Red-Footed Booby (Sula sula rubripes) launches herself from atop one of the steep basalt cliffs adjacent to Kilauea Point, north Kaua'i. Immature Red-Footed Booby (Sula sula rubripes), Kilauea Point National Wildlife Refuge, north Kaua'i. A Hawaiian Goose (Branta sandvicensis; "Nēnē" in Hawaiian) roosting atop one of the steep basalt cliffs in the Kilauea Point National Wildlife Refuge, north Kaua'i. Hawai‘i’s state bird. The nēnē measures between 22 to 26 inches in length, has a black head and bill, yellow-buff cheeks, a buff neck with dark furrows, and partially webbed black feet. Its loud calls are like those of the Canada goose and when disturbed, its call resembles the “moo” of a cow. 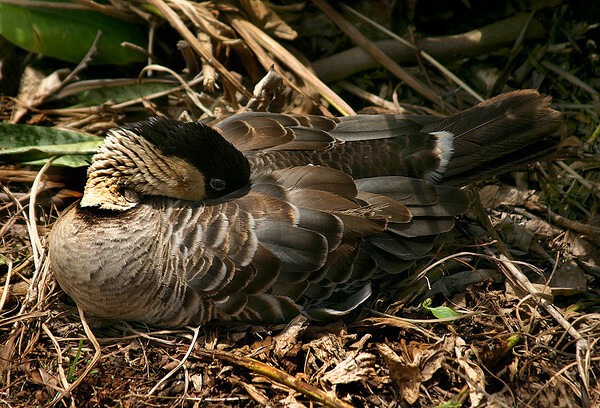 ossil records show that the nēnē used to live on all the main Hawaiian Islands. 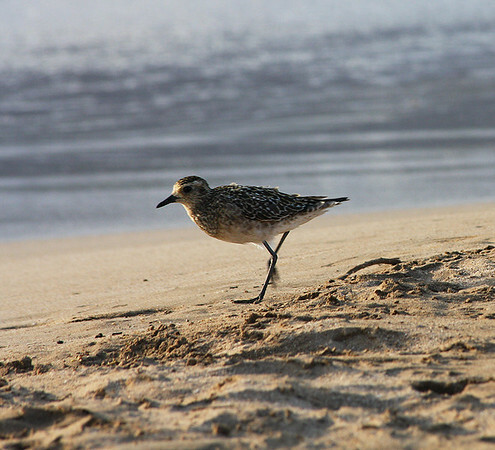 It is believed that they were abundant (about 25,000 birds) on the Big Island before the arrival of Captain James Cook in 1778. Scientists believe that the Maui population became extinct before 1890. The decline in numbers was accelerated during the period of 1850 to 1900 due to aggressive hunting of the birds and collecting of their eggs. In 1951, the nēnē population was estimated at only 30 birds. 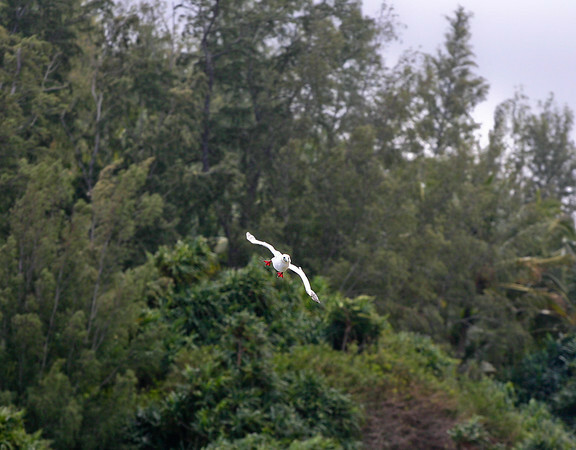 A small population was reintroduced at Kīlauea Point National Wildlife Refuge in 1991. Approximately 1,700 nēnē exist in the wild today. The species is federally protected under the Endangered Species Act.The nēnē is extremely vulnerable to predation by introduced animals like rats, dogs, cats, mongooses, and pigs. In more recent studies, research shows that continuing decline of the nēnē population in the wild can be attributed to low productivity, perhaps caused by the poor available nutrition in their habitat. 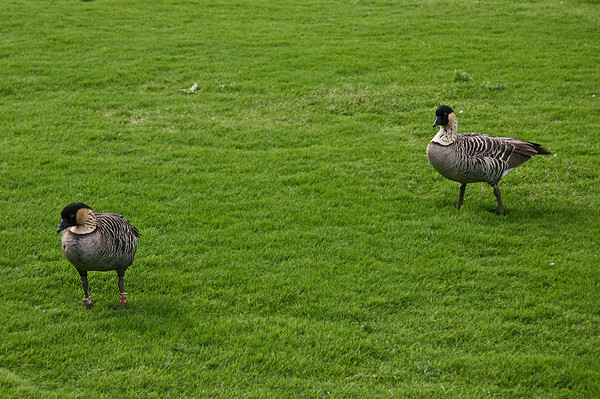 The Hawaiian Goose or Ne'ne (Branta sandvicensis). These fellows live the good life at the Kilauea Point National Wildlife Preserve, north Kaua'i. See http://en.wikipedia.org/wiki/Hawaiian_Goose for more information about the Ne'ne. 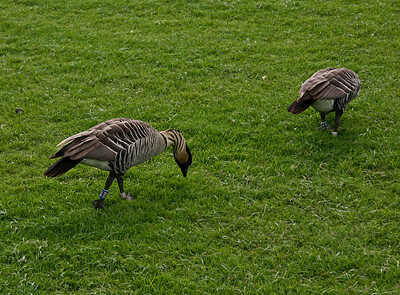 The Hawaiian Goose or Ne'ne (Branta sandvicensis). These fellows live the good life at the Kilauea Point National Wildlife Reserve, north Kaua'i. See http://en.wikipedia.org/wiki/Hawaiian_Goose for more information about the Ne'ne. 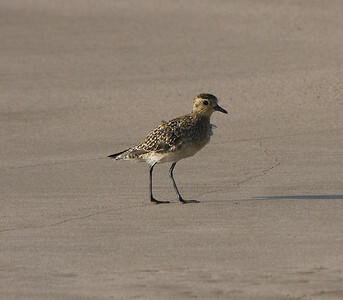 A Pacific Golden Plover (Pluvialis fulva; "Kōlea" in Hawaiian) forages along a beach, Kihei, south Maui. Kōlea eat a variety of items including insects, crustaceans, berries, leaves, and seeds. Kōlea can eat marine and freshwater invertebrates, too. 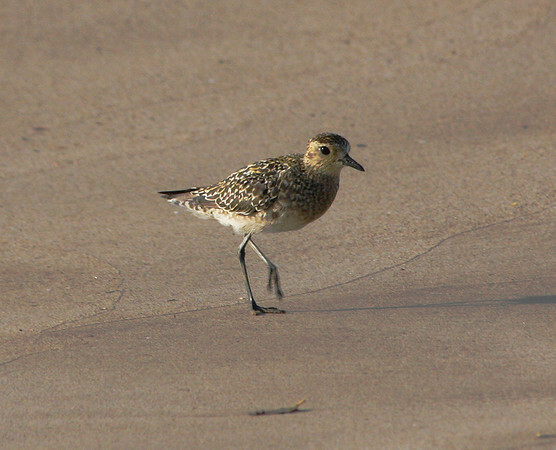 It is interesting watching the shorebirds forage for food by a sequence of stop-run-stop! They will scan an area for food and then peck at it until it is captured. In Hawai‘i, Kōlea feed on weevils, crustaceans and even snails. 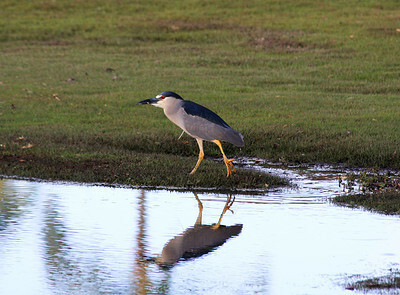 A Black-crowned Night Heron (Nycticorax nycticorax) hunting insects in a deep puddle after a heavy rain. Kihei, south Maui. 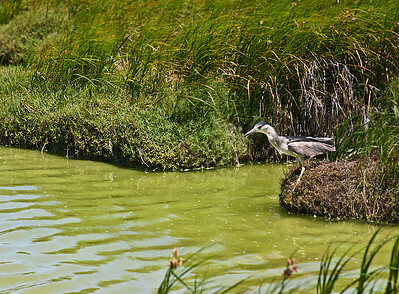 A Black-Crowned Night Heron (Nycticorax nycticorax) stalking fish along the shoreline at Kanaha Pond State Wildlife Sanctuary (Kahului, Maui). The following photographs show this very determined hunter stalking and eventually catching some of the small freshwater fish. The photos span about an hour of time I spent patiently watching and edging closer to this very wary bird. Keeping a low profile at the water's edge so as not to startle the freshwater fish feeding and breeding close to shore, our Black-Crowned Night Heron (Nycticorax nycticorax) moves on, hoping for an opportunity to snag a meal. Kanaha Pond State Wildlife Sanctuary, Kahului, Maui. 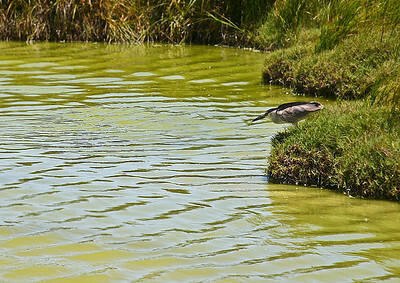 Our Black-Crowned Night Heron (Nycticorax nycticorax) stalking fish along the shoreline at Kanaha Pond State Wildlife Sanctuary (Kahului, Maui). The fish surfaces and the heron sees his chance! 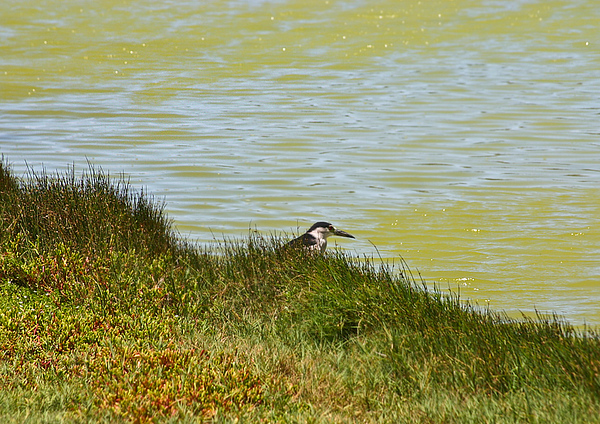 In this shot the bird has his prey (small fish) in sight and is waiting patiently for the right moment to strike. 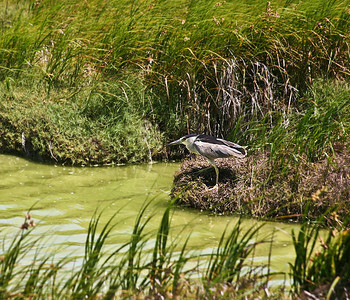 A Black-Crowned Night Heron (Nycticorax nycticorax) stalking fish along the shoreline at Kanaha Pond State Wildlife Sanctuary (Kahului, Maui). Sensing the time is right to nab his fish, the bird begins his push-off from the bank. 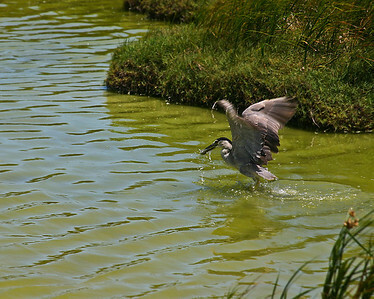 A Black-Crowned Night Heron (Nycticorax nycticorax) stalking fish along the shoreline at Kanaha Pond State Wildlife Sanctuary (Kahului, Maui). 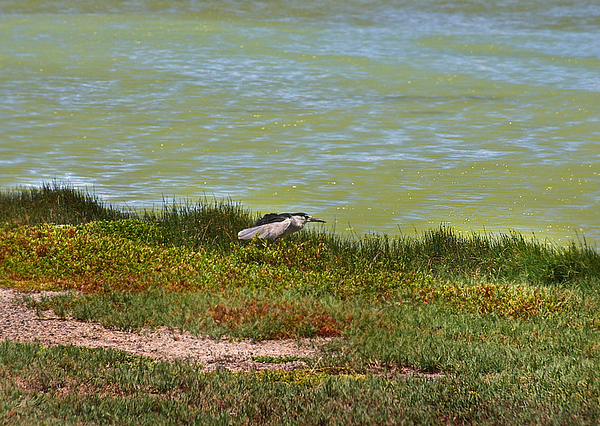 A Black-Crowned Night Heron (Nycticorax nycticorax) stalking fish along the shoreline at Kanaha Pond State Wildlife Sanctuary (Kahului, Maui). He nails the fish on the first try!